Courtesy of Big Green Theater. Happy Earth Day, Bushwick! 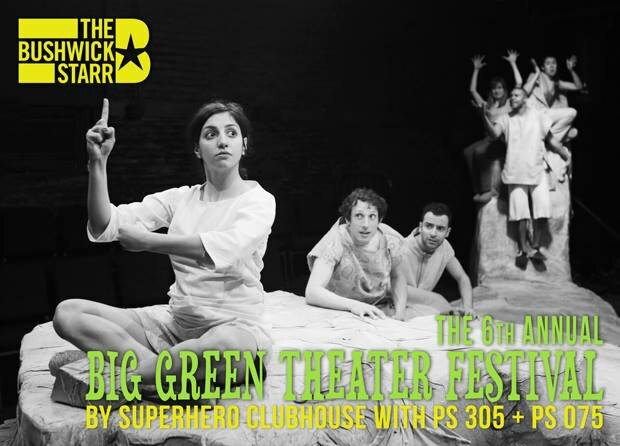 Locals who are looking for a sweet way to observe the holiday can stop by the Bushwick Starr this weekend to take in the culmination of the 6th annual Big Green Theater, the eco-playwriting workshop that the Starr runs in collaboration with local eco-theater collective Superhero Clubhouse. This year's plays, which explore the concepts of biodiversity and extinction, were written by fifth graders at P.S. 305 and P.S. 075 over the course of the past four months as part of an after school program. The plays will be performed by professional actors this weekend, and the budding dramatists and their families will be in the audience. This year marks the first occasion on which BGT was able to run an additional program outside of the local school system: funding from the Mental Insight Foundation supported a third workshop that was offered to participants at El Puente's Bushwick Leadership Center. Other funding from the program comes from The New York City Council, Cultural After School Adventures (CASA) Program, the Reva & David Logan Foundation, the Puffin Foundation, and Con Edison. The plays run all weekend: Friday night is a special benefit performance, which starts at 7pm, costs $18 and includes admission to an after party with music and refreshments. On Saturday and Sunday, the performances are free, though reservations are recommended: Saturday's showtimes are 1pm, 4pm and 6pm (for PS 305, PS 075 and El Puente, respectively) and Sunday's showtimes are 1pm and 4pm (just 305 and 075 that day). "The Bushwick Starr is committed to being a part of community environmental awareness, and this program is our way of actively working toward change through a creative and interactive process. With BGT, we are introducing a new model for arts spaces to provide community-driven green initiatives that serve a global cause," the organization states. Stop by—we'll see you there! The Bushwick Starr is located at 207 Starr Street between Wyckoff Ave & Irving Ave, off of the Jefferson St stop on the L train. Reserve your tickets here, RSVP on Facebook here. The Bushwick Starr's website is thebushwickstarr.org; follow the Bushwick Starr on Facebook, Instagram and Twitter.